- LIBYE - Archaeologists in contact with colleagues in Libya say that their nation's antiquities appear safe despite the chaos in the country. That news is contrary to reports earlier this week, which claimed that Libya's museums were being plundered and sites destroyed in NATO bombing raids. Libya boasts a host of ancient Phoenician and Roman sites, as well as major collections of ancient artifacts in Tripoli's Jamahiriya Museum and other smaller museums around the country. So the claims of damage prompted fears of a replay of Baghdad in 2003, when the famous Iraq Museum was looted. But Western archaeologists and Libyan sources say that there is no evidence that such destruction is taking place. - CHINE – Luoyang - The equine bones, found in the Chinese city of Luoyang, have remained undisturbed since the early Western Zhou dynasty. Archaeologists believe the 12 horses lying on their sides show the animals were slaughtered before burial, not buried alive. As well as the horses and five chariots, bronzes and ceramics have escaped the clutches of history’s grave robbers. Archaeologists are convinced that the perfectly preserved tomb belongs to an official or a scholar of standing, given the pottery, metal weaponry and inscriptions. The tomb, a vertical earthen pit, has excited historians since it was discovered during the construction of a hospital. 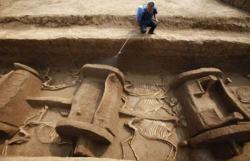 It gives an unprecedented insight into the funeral customs in the early Western Zhou dynasty. It was the time of the great Chinese philosophers of ancient times, including Confucius. The latest find is reminiscent of the famous terracotta army of thousands of preserved soldiers, which was discovered in 1974 in the Lintong district. It had also remained undisturbed for thousands of years. - USA – Hawwiku - Hawikku, sometimes called Hawikuh, is a Zuni word meaning “gum leaves.” It is located about 15 miles southwest of the Zuni Pueblo in northwestern New Mexico. In 1539, the first non-native of the Southwest, the Moorish slave Esteban, who was part of the Fray Marcos de Niza expedition, met Zuni’s ancestors at this pueblo, with disastrous results. A year later, the first meeting of the Spanish with the pueblo occurred on July 7th, 1540, thus beginning the recorded history of the western New World, much as the east coast history of the New World began with the meeting of natives at Plymouth Rock about 80 years later. Explorer Francisco Vasquez de Coronado, on his quest for the legendary Seven Cities of Gold followed Marcos De Niza’s trail to the cluster of six pueblos and after a brief battle, overcame fierce Zuni resistance. Coronado named the pueblos “Cevola”, which in later translations became the word Cibola; when the sunbaked, golden-hued pueblos yielded no proof of Aztec gold, he moved on. - ROYAUME UNI – Nybster - The dig’s director of excavations, Dr Graeme Cavers, said it has been a worthwhile project in order to further the general knowledge surrounding brochs in the county. “These excavations have demonstrated just how complex stone structures in Caithness can be and how sites like Nybster repeatedly went through phases of reconstruction and change throughout the Iron Age and early historic centuries,” said Dr Cavers. “This excavation was the first to investigate rampart structures around a broch in Caithness and will help to further our understanding of how, when and why these enigmatic structures were built.” Dr Cavers explained there were quite a few findings from the excavations in April. May that focused on what is believed to be a defensive rampart. He said the first phase of the rampart’s construction was around two-and-a-half metres thick, built on a steep outcrop of rock, which may have been enhanced by quarrying to create a deep outer ditch. In a later phase of activity, the rampart was enhanced by doubling its thickness. “At this stage, the original entrance through the rampart was dismantled and rebuilt to incorporate a cell or room within the wall,” he said. “The cell had a paved floor and was accessed by climbing a short flight of steps on the inner wall of the rampart before stepping down into the interior. A large, worn quern stone, used for grinding grain by hand, was found inside the cell.” The final phase of activity was the insertion of stone boxes into the ruinous remains of the broch settlement, “very possibly” late Pictish or Viking burials. Excavations earlier this month concentrated on one of the “Jelly Baby” houses, so called through their similarity in shape to the popular sweets. These buildings usually date to the Pictish period (third to 10th centuries AD). “We excavated an oval building with a cell at both the northern and southern ends. Layers of paving and numerous hearths were revealed in the interior – these hearths will provide valuable dating evidence,” said Dr Cavers. “An area of burnt material to the west of the ‘Jelly Baby’ house yielded the most finds in August, including part of a Roman bead, evidence that trade and exchange networks were in place.” Other finds from the excavation included pottery, moulds for making bronze pins, crucible fragments relating to metalworking, as well as cannel coal, often used for making jewellery, a bone needle and a small stone pendant. Analysis of these artefacts and soil samples will help date the phases of construction more accurately, and provide a more detailed picture of activity at Nybster. - ROYAUME UNI – Kilwinning - An arrowhead dating back to 3500 BC is the latest find during the second week of the Kilwinning archaeological dig. 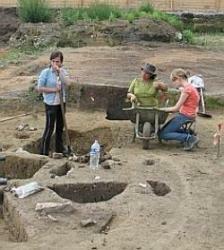 Archaeologists on site believe the flint leaf arrowhead dates from early Neolithic 3500 BC. Tom Rees, of Rathmell Archaeology, said: “While this may be a stray loss by a prehistoric hunter, Neolithic flint arrowheads during the mediaeval period were termed elf-shot and used as amulets to protect the wearer, giving a more intriguing process for bringing the arrowhead onto our site.” That wasn’t the only find during the dig around the grounds of the Abbey as one trench uncovered a skeleton – the first of this year’s dig in the chapter house. They believe it is from a medieval burial as the chapter house was typically used for burying abbots and senior monks. Four more weeks of excavation are ahead of the team, but already a range of medieval and post-medieval finds have been recovered including slate carved as gaming boards. - ROYAUME UNI – Cockermouth - An archaelogical excavation of Cockermouth’s Mill Race uncovered evidence that it was connected to at least four mills in the town during the Victorian period. The second phase of the community excavation, led by NP Archaeology to uncover the history of mill sites in the town, revealed that the race would have acted as a current or channel running from the mills into the River Derwent. History experts believe it could have been connected to Derwent Mill, a blood mill, a corn mill and a flax mill and the Mill Race may have been used as far back as the medieval period. The third phase of the project, a geophysical survey of a field north of the Memorial Gardens car park, took place this week to trace the line of the Mill Race.